A lot of folks spend a lot of time looking up at the sky. But, there’s an incredible amount of exploration right under our feet that gets no press (except when someone has been stupid and killed themselves or someone else). I’m talking about caving – or – cave exploration – or -spelunking. There are some amazingly exciting expeditions going on in the cave exploration world year after year. And some of these adventurers are finding some wild and unbelievable things way-down-under. First, there is the mandatory first stop – the NSS, or the National Speological Society. 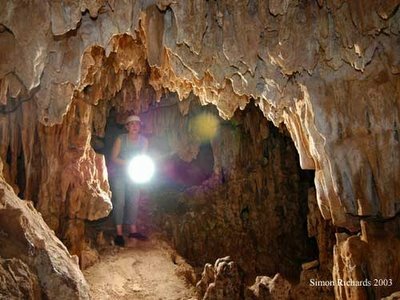 Then there is the group that is focused on the remarkable caves of the Yucatan. Or you can get a wonderful look at cave animals and plants here. If you have a scientific bent, you can check into the archeology of cave exploration here.